The chicken wing may have been overlooked as a food for a long time but has made up for lost time since the discovery of the Buffalo Chicken Wing. Originally created in Buffalo, NY at the Anchor Bar in 1964, the Buffalo Chicken Wing brought wings out of the stock pot and onto tables and bars across the country. To be called "Buffalo Chicken Wings" you would have to know the secret sauce and probably be in Buffalo. But certainly there are many many tasty recipes for cooking chicken wings. You will find a couple really good ones below. There are basically 2 schools of though when cooking chicken wings. Fried and oven baked. Fried is how they where originally prepared but baked is just as tasty. This is a recipe that you have to wing, no pun intended. Depending on how many wings you are cooking you will have to eyeball the amounts to your taste. If you are frying a dozen wings, you will be using approximately 2 cups of flour, 2 teaspoons salt and 1 teaspoon ground pepper. Salt and pepper flour to taste and pour onto a plate. Coat chicken wings in flour. Fry until golden brown, flipping once. Drain and cover with Original Anchor Bar Sauce. Serve hot with celery stalk and blue cheese dressing. Mix together butter, hot sauce and honey. Baste chicken wings using a basting brush and bake for 45 minutes to 1 hour, flipping and re-basting half way through. Serve hot with celery stalk and blue cheese dressing. Rub chicken wings with liberal amounts of Knox's Chipotle BBQ Rub. Cook chicken wings for one hour, flipping when half way done. You can also mix Knox's Chipotle dry rub with butter and use as a baste while cooking chicken wings. Rub chicken wings with liberal amounts of Knox's Jamaican Jerk BBQ Rub. Cook chicken wings for one hour, flipping when half way done. 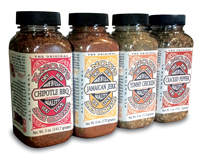 You can also mix Knox's Chipotle BBQ rub with butter and use as a baste while cooking chicken wings. Jen Miller founder of 'Jen Reviews' provides an excellent chicken wing rcipe by Michael John Blncaflor. Visit Jen Reviews for the recipe.